Does this product have an on and off option? 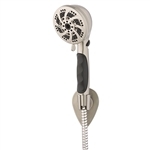 Does Oxygenics 92481 Fury shower head come in gold? Does the Oxygenics 92481 Fury RV Shower Head shut off while showering? Can this Oxygenic Fury Shower Head connect to a tub faucet as the water source?